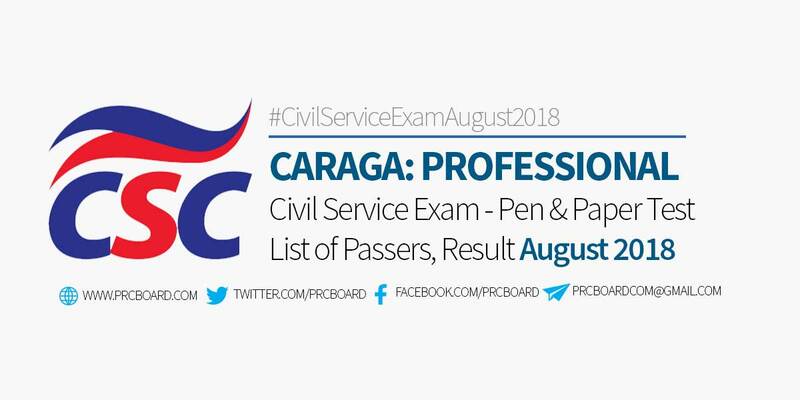 MANILA, Philippines - The CARAGA Passers Professional Level in Civil Service Exam (CSE) conducted on August 2018 including the full results, top examinees and other important announcements are released by the Civil Service Commission (CSC) within 41-60 days after the eligibility exams. Below is the complete list of passers for August 2018 Civil Service Exam - Professional Level in CARAGA (Region 16), courtesy of CSC. kailan po ba ang result ng cse exam? SANA PUMASA AKO. KINAKABAHAN NA AKO. HUHU WHEN PO BA I POPOST ANG RESULT? I hope that I'm gonna pass the exam because it is one of my way to show to my parents that I never waste their hard work on spending all of my expenses in my school days, to get a job in in order to help my family and most importantly to make them proud of me. God please hear our prayer. Sana pumasa ako. Kilan po ba ang result? kailan po ba result yung aug 12 test? nakakakaba..sana ay palarin akong pumasa :) Lord pls grant my wish. Thanks GOD... THANK YOU.. THANK YOU... THANK YOU...To GOD be the Glory..